I'm going with flights of whimsy this week, peeps. Fun and happy stuff, for the most part. Unrequited love, as a topic, is near and dear to me. I'm pretty sure we've all felt it. I certainly have. It hurts, but it doesn't have to be a sad and sappy thing. Since I equate this topic with youth, that's where I'm going with it. 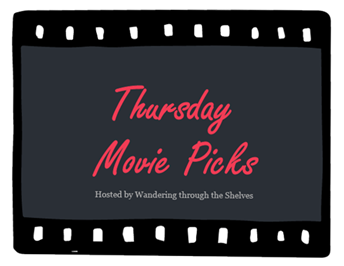 I feel I'm sensing a trend with the topics over at Wandering through the Shelves' Thursday Movie Picks here in the last few weeks. Oh, yes. Valentine's Day is nigh. I'm in awe of this movie. When I first saw it back in 2009, I couldn't get it out of my head. Like a good love song that you love, then hate, Marc Webb's "500 Days of Summer" stays with you. Joseph Gordon-Levitt plays Tom (one of the most relatable characters I've encountered in a movie). He writes greeting cards for a Hallmark-type company situated in Los Angeles. Enter Summer (Zooey Deschanel), the new girl in the office. When she compliments his love of The Smiths during an awkward elevator ride one day, Tom is smitten. These things happen. The movie is structured out of order over a course of, well, 500 days. The entirety of a relationship doomed to go nowhere because, well, Summer "doesn't want a serious relationship" (heard that before) but sort of leads him along anyway. This is an beautifully written, expertly-made, and truly original romantic comedy that strikes to the hard truths of unrequited love. And that Hall and Oates dance number! Money! Sometimes you find a movie that probably shouldn't work for you and then it does. "I Love You, Beth Cooper" is one of those. I find that, when I randomly catch a teen movie that I deliberately missed because of bad reviews, I always end up liking these types of movies. I feel the pain of lead character Dennis Cooverman (Paul Rust). He is the smartest kid in his graduating class, the valedictorian. He wants a girl who is far too much woman for him. I was always guilty of this myself in high school. To start the movie, he delivers one of the best speeches of its kind. A spewing of truths unrivaled in any "teen movie" I've seen. Yes. He stands up there and tells the most beautiful, popular, out-of-his-league girl in school, the title character played by the gorgeous Hayden Panatierre, that he is in love with her. And has been since forever. Then, he gets to know her in a series of high-jinks that don't always work, but so what. This movie is fun, and it made me happy. David Wain's movies don't always work for everyone. I never watched the much-loved sketch comedy show "The State," but that's his crew, most notably Ken Marino, Jo Lo Truglio, Michael Ian Black, and the brilliant Michael Showalter. These dudes are in all of his movies, and all the ones I've seen are brilliant. They're just my kind of comedy. "Wet Hot American Summer" is, in fact, my favorite comedy of all-time, bar none. The hero, if you will, is Michael Showalter's Coop. He and the others are counselors at a Jewish summer camp in the early '80s. It's the last day of camp. That's enough to make a great movie. Then, you add in Amy Poehler, Janeane Garofalo, David Hyde Pierce, Paul Rudd, Elizabeth Banks, Christopher Meloni, Bradley freakin' Cooper. It's just unreal. Coop has what I like to call "standards are too high syndrome." It's real. Look it up. He is in love with the hottest of the counselors, Katie (Marguerite Moreau). She's not interested in that. She'd rather just make out with Paul Rudd's Andy, the resident douchebag of the crew. All of these actors were already past or nearing 30 when they made this movie, for the most part, and all are playing teenagers. That's funny to me. And this movie goes places that you never see coming via drug-fueled trips into town, canoe trips that go awry, and a talent show for the ages. There are training montages, chase sequences, accidental homicides, and mess hall food. There is unrequited "young" love in the form of camp crushes on many different levels that remind us what it was like to be a kid, even if the kids aren't the stars of this show, and even though the older kids are played by full-grown adults. I watched this movie three times a week my first year teaching. It was the only thing that helped me through it. Thanks, David Wain! And then there's this! Coming this summer on Netflix! I also went with 500 Days of Summer, it was a wonderful movie. Wet Hot American Summer didn't work for me as a whole, but I liked the character's story. Great picks! Thanks. Wet Hot American Summer is just the perfect comedy for me. I love how its self-awareness. LOVE Wet Hot American Summer! Can't wait for the Netflix series. Saw a bit of I Love You Beth Cooper on cable once and it seemed cute. I don't know anyone who hasn't fallen for (500) Days of Summer. So great. Yes! Me too man. It makes me happier than any other comedy! I Love You, Beth Cooper is incredibly cute. Not great, but it reminds me of high school love, and I just couldn't stop watching it when I caught it on cable myself. Oh, I picked (500) Days of Summer, too, for two consecutive weeks! That's a famous model of unrequited love, isn't it? It so is. Great for this topic and the model for romantic comedies in general if you ask me. Unrequited love movies can be a depressing lot, nice that you went for the lighter fare with comedies. Thanks. I just needed to go light on this one. I went with (500) as well. I love that you picked Wet Hot American Summer! I never did see I Love You, Beth Cooper. Thanks. Wet Hot American Summer is just so great! And really works for this topic, I think. I have this very special place in my heart for (500) Days of Summer...very special. It's a special movie. I've dated Summer before. Several Summers actually. They cause pain...and love. It's just brutal. Please see Wet Hot American Summer! I love it. Just be ready for ridiculous, non-sensical comedy. Everybody loves 500 Days more than I did, it was okay but just okay, it's perfect for the week though. Haven't seen Beth Cooper and I've been meaning to rewatch Wet Hot American Summer, I think I was in the wrong frame of mind the first time and it did nothing for me but everyone seems to love it so I think I missed something. It seems worth another shot. Wet Hot American Summer is just for certain days. It's my go-to rainy day movie. It's short, sweet, and funny as hell. Stupid funny, which is my favorite kind. It's somehow smart for me as well though. It's very tongue-in-cheek. I love that! Do it, man! Wet Hot American Summer is a great comedy. Silly and stupid at times, but great! I Love You, Beth Cooper is not a great movie, but it is for this topic. And I really enjoyed it. It doesn't always work, but it tries and it's sweet enough. I love JGL and Deschanel, so it worked perfectly for me. One of the great romantic comedies if you ask me. It seems (500) Days of Summer is a popular choice this week. I loved it as a film, and would have chosen it again had I not used it for last week's theme. "I Love You, Beth Cooper" was a cute movie, nothing over the top but a typical, enjoyable teen comedy. Wish I could say the same for "Wet Hot American Summer," that one didn't work for me for some reason. Guess I could give it a second chance someday though. I have only watched 500DOS. Wet Hot American Summer seems pretty interesting!